Beijing, September 25th, 2017 ---- China’s development zones are likely to present billions of dollars in business opportunities for ICT vendors as their digital transformation boosts IT spending, according to a new report by IDC. Total annual IT spending by China’s national development zones to drive their digital transformation will exceed RMB10 billion (about USD1.5 billion) a year, said Lianfeng Wu, IDC China’s Vice President &Chief Research Analyst. In his keynote speech introducing the report, Digital Transformation Boosts Industry Innovation and Upgrading, delivered at the 10th Annual Informatization Conference of China Development Zones, Mr. Wu said the development zones face challenges and greater pressure to transform and upgrade, yet for ICT vendors, this presents huge room for growth and tremendous business opportunities. After more than 30 years of development, China’s national economic and technological development zones have become leaders in promoting innovation, transformation and development in China. In their next phase of development, the zones’ core tasks will be to build a modern industry system, enhance scientific and technological innovation and strengthen green development. The modern industrial clusters of national economic and technological development zones boast the fastest economic growth and most attractive investment environment in their cities and surrounding areas. The largest national economic and technological development zones possess special industrial characteristics and supporting infrastructure, and have become a vital means for China to embrace changes in the international industrial chain. In February 2017, the General Office of the State Council issued Opinions on Promoting the Reform and Innovative Development of Development Zones . In these Opinions , it called for efforts to strengthen overall planning for all types of development zone, accelerate existing zones’ transformation and upgrading, promote institutional and logistical innovation, and improve their management regulations and policies. It also sought to further enhance the advantages of development zones by building them into hotbeds of new industrial development, with a high-level business environment; clusters of mass entrepreneurship and innovation; open economic principles and institutional innovation so as to drive the supply side structural reform and create new engines for economic growth. IDC believes the future of China’s development zones will have for main elements – intelligence, innovation, environment, and community. Intelligence : Development zones need to develop smart industries, especially fast-growing new technologies such as cloud computing; Big Data; advanced mobility; social commerce; 3D printing; robotics; AI (artificial intelligence); IoT (Internet of Things); VR/AR (virtual reality/augmented reality); and next-generation security. These markets at the vanguard of technology are expected to register a CAGR of more than 15% over the next five years, providing huge growth space for development zones. Development zones must themselves become intelligent, building intelligent infrastructure, intelligent platforms and intelligent applications to improve their ability to attract new business and investments as well as better serve the enterprises and residents they already host. The largest development zones are expected to spend more than RMB 100 million annually on IT, while medium-sized zones will also spend tens of millions of RMB on technology each year. IDC predicts total annual IT spending by national development zones in China alone will exceed RMB10 billion (about USD1.5 billion) a year, presenting a huge market for ICT vendors. Innovation : In 2017, some 16,000 new companies are being set up in China each day thanks to its mass entrepreneurship and innovation policy. Many of these startups have innovative ideas, products and services, and they need the government to continuously innovate services, streamline workflow, and simplify examination and approval formalities to support their future needs. Development zones should therefore strive to centralize service functions and set up one-stop service stations to meet the needs of innovative enterprises. Environment : Energy conservation, emissions reduction, green and environmental protection are among the main themes of China’s future economic development. Development zones, as the carriers of economic development, will play a crucial role in this process. Cloud data centers and green data centers will contribute enormously to energy conservation and emissions reduction. Air, water and soil quality monitoring are also of great importance. Green mountains and clear water are “gold and silver”. They will become a key competitive advantage for development zones as they seek to attract business. Community : Improving livelihood is an important element in raising the well-being of residents and achieving a well-off society. Green initiatives improve livelihoods, and so too does industry-city integration. Traditionally, development zones separate industrial areas from residential ones, invisibly affecting residents’ happiness, increasing resource consumption and worsening traffic. As they transform, development zones must put the concept of industry-city integration into practice and organically integrate residents’ work, study, lifestyle and entertainment facilities to meet future needs. This will raise residents overall happiness and truly fulfill national goals of safeguarding growth, stability and livelihood. Lianfeng Wu , Vice President & Chief Research Analyst of IDC China , commented: “The successful transformation of development zones requires the concerted efforts of government, ICT vendors and industry users. For the government, it is necessary to create the environment, integrate resources and establish an ecosystem. The 10th Annual Informatization Conference of China Development Zones was held under the theme “New Business Forms, New Opportunities & New Developments” from September 5 to 7, 2017, in Chizhou City, Anhui Province. 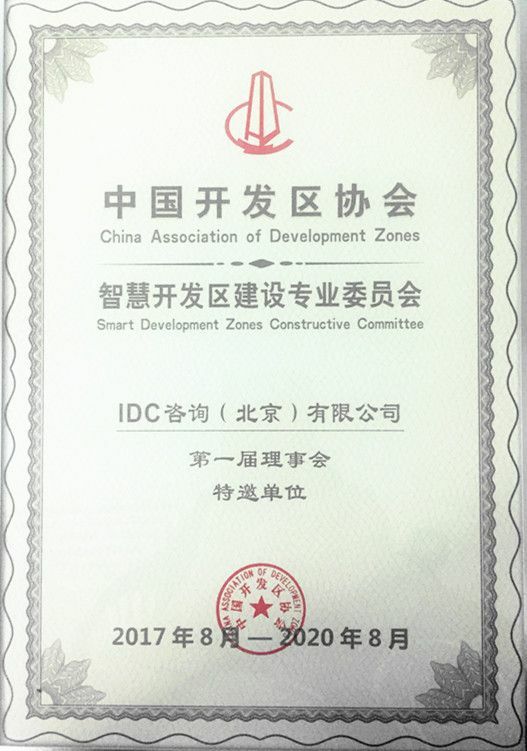 The event saw the official establishment of the Smart Development Zones Construction Committee under the China Association of Development Zones, of which IDC China is honored to be a co-founder.